The four tabs under the Report tab collectively allow users to view backup run progress data from many perspectives. The Summary Tab, the first of the four tabs, gives a quick overall summary of the backup run on a particular date of a particular Backup Set. The Report pages will not display data from Backups done prior to installing ZMC. 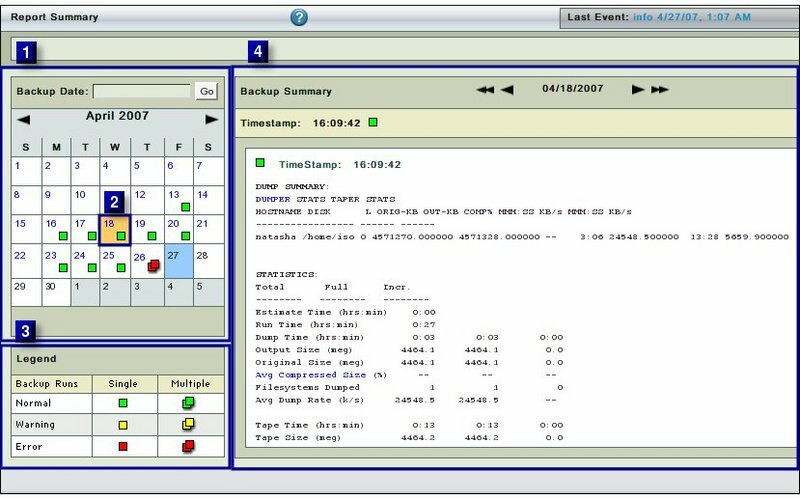 Like all other functional pages of ZMC, the Summary Report page has its main functionality in the center, while other common-to-most-pages functionalities are grouped at the top of the page. Explanation of common functionalities enclosed in a light blue rectangle at top in Fig. 1 can be found on Common Functionality page. 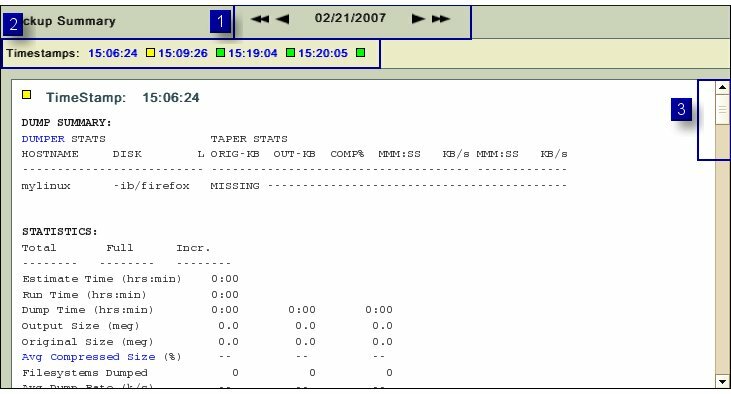 The main functionality of the Summary Report page is to allow users to view a summary report of a past backup run of a Backup Set. The Summary Report page is visually divided into two panels. The Left hand panel (No 1 above) contains a Calender control sub panel(No 2 above) and a Legend sub panel (No 3 above). The Right hand panel (No 4 above) mainly contains the text of summary reports. It also has a Calender Turner aid at the top. This aid is common to all the four pages of Report Tab. By default the Summary Report page opens with the current month calender shown in the Left hand Date and Legend panel. The top portion (No 2A in Fig. 2) consists of a Backup Date input box along with a Go button. The input box accepts dates in both mm/dd/yyyy and mm/dd/yy formats. After the date has been entered in the input box,users can press the Enter button on their keyboard or click the Go button on the screen to reach to that date in the Calender Control. The Summary Data report, if any, for that date will be displayed in the Right hand panel. The bottom portion (No2B in Fig. 2) consists of the Calendar Control. Cells of individual dates display appropiriate Legend. The Legends differentiates between six outcomes of a Backup run. Backup with Warning(s) Single or Multiple Backups on the same day. Backup with Error(s) Single or Multiple Backups on the same day. Normally, there will be only one Backup run on each day for a backup set. However, it is possible to force multiple backups runs on one single day by doing so from the Backup Activate page where an Immediate Backup button is available. In all cases, there will be only one Legend in the Calender Control for that date. However, the Summary will contain details of all the Backups that were run that day for that Backup Set. The Right hand Report Summary panel has the following navigational aids i.e. This is labeled (No 1 below) and pressing either of the two inner single arrows allows the users to change reports one day at a time. When either of the outer two arrows signs are pressed, the Calender changes by a week (seven days) at a time. A List of Timestamps (No 2 below).The Timestamp show the time at which the backup run was initiated. Clicking on the Timestamp hyper link will take users to the data within the Summary Report that deals with that time stamp. When required, horizontal and vertical scroll bars appear in the Report Summary window automatically. Usage by Tape including Failure Summary and Details as well as Strange Summary and Details. There is no dependency linked to this page. Users are free to move wherever they like. Many times users will move to other Report pages to get a different perspective on the data. Occasionally users will want to visit the Event Log View page to see the full details of the backup run.